REGISTER for our SPRING session TODAY!! Click the image below to access my Game-Based Learning: Unleashing the Power of Collaborative Gaming presentation resources. If you want to dive deeper into Game-Based Learning to unleash the power of gaming in your classroom, you can take my popular Game-Based Learning online course for in-service or graduate credits. Click the images below to access my sold out ISTE 2017 BYOD Session resources. There are numerous ways to create and share in today’s tech-obsessed world, and as teachers (and parents), I believe we must model and demonstrate how this is done. Our students need to see how easy it is to create and share content with an authentic audience. The power to do this is literally in the palms of their hands. While many of my students get a glazed look on their faces as I rant about the benefits of actively creating versus passively consuming content, I am aware that I am making sense to at least some of them. I’m proud to report that my twins, Ava and Emma, are in the latter group. They surprised me last weekend when they wrote a blog post using the writing skills and strategies they learned in school to persuade me to purchase a trampoline. Ava and Emma wrote this persuasive post on an iPhone using Notes, then copied and pasted it into Kidblog (a blogging platform that I use with my 6th graders). Ava explained that they chose to post it on the blog because they knew that as a “tech guy,” I loved the platform and they wanted to impress me. And they were right because I was blown away! They wrote for a purpose, authentically. The idea came from them. It wasn’t another artificial teacher-generated assignment. This is an excellent example of real world application of knowledge (writing skills and technology tools). It’s content creation in it’s purest form, and it made a big impact on their audience (me). They had an audience (me) in mind, and a goal had been set and effectively executed. They formulated a persuasive essay using the writing strategies they’ve learned at school and selected the digital platform by which to share it. Click the image below to read Ava and Emma’s persuasive blog post. Click the image below to read their thank you letter. Click the images below to access my EDxEDNYC presentation resources. Student voice and choice are critical components of the Literature Circle experience and these can be greatly enhanced with technology. In my 6th grade class, students are given multiple opportunities to make important choices that drive their learning process within the Literature Circle dynamic. Since they are very familiar with the Google Classroom platform (I’ve been using it all year), students created Google classroom classes for their Literature Circle book groups. I asked them to add me as a co-teacher so I can monitor the class stream for each group. In some groups, one student assumes the role of teacher for the week and then this position is rotated in addition to the roles in the Literature Circles. This allows students to submit digital evidence in the form of Google Docs, BookSnaps and/or any other application chosen. In other groups, all members join as “teachers” for their class. It’s totally up to the students! Students post reminders in the class stream and comment when necessary. School appropriate chat rules apply and individuals who don’t adhere to our code of conduct can be muted with their comments deleted if necessary. Students are encouraged to select and/or customize the class theme of their Literature Circle Google Classroom class. They can choose from the themes available in Classroom, or upload their own pictures. One group decided to change the class theme each week giving each group member an opportunity to choose it. Students post job assignments (with descriptions) to be completed for upcoming meetings. One group even found a Literature Circle job description document and added it to their class stream. Students post digital resources including links to Audiobooks and PDFs of their books so group members can complete assigned reading at home even if they leave their books in school. They are encouraged to use the digital tools and resources we’ve used in class throughout the school year. It’s amazing to see how easily they apply this knowledge! Do you want to know more about the plethora of digital tools that are available for Literature Circles? Technology, when used to create content and connect students with authentic audiences, empowers learners and prepares them for jobs that don’t even exist yet. It is critical for schools to facilitate and promote a culture of content creation. Educators that teach students how to use tech tools to actively create content are EMPOWERING these learners by giving them the skills, strategies, and experiences they’ll need as they move into the future. To begin, schools must work to create an equal balance of content consumption and content creation in their classrooms. Too many school systems have spent millions of dollars to equip students and teachers with the latest tech tools only to utilize them in the wrong ways. 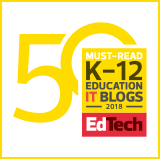 Rows of silent students completing digital worksheets on their Chromebooks or iPads is not what one would call effective technology integration. The digital use divide between passive consumption and active creation must be closed! Teachers in classrooms should subscribe to the 50-50 Rule of technology integration. If students CONSUME content in the classroom for 25 minutes, they then need to CREATE content for the same amount of time in that classroom. For example, if I direct my students to passively consume content by completing assignments in Castle Learning, IXL or ReadWorks Digital, I must allow them to spend the same amount of time creating content using their devices. This can be done in a variety of innovative ways including creating How-To Videos for Genius Hour projects, making Google Slides presentations for Iron Chef Jigsaw lessons or writing a new post for the class blog. It’s very important to strike this balance between consumption of content and creation of content on a regular basis. It could also include students putting tech devices away for the remainder of the class and making something in a Makerspace-like environment. What do you think about the 50-50 Rule of Technology Integration? Would you suggest a different ratio? Please write a reply in the comment section at the end of this post.